In Ireland at the start of the festive season, usually the 1st Saturday in December, there would be a pilgrimage of sorts where the country folk would head to the “Big Schmoke” better known as Dublin to do their annual Christmas Shopping. There they would mingle with the Jackeens (respectable Dublin people) in the big department stores like Arnotts, Clery’s or if they were really big farmers, Brown Thomas or Switzers on Grafton Street and buy the socks, underwear or ties they would generously gift to their sons and daughters. They might also have a couple of pints in a favorite Dublin pub, one they might frequent when their county team on a rare occasion got the opportunity to test the mettle of the mighty Dublin team on the pitch in Croke Park and were beaten soundly by the Dubs. There they would enjoy the banter back and forward with their city cousins and lament about the days when their team could actually compete with the fine players of the mighty metropolis…..”God be with the days” they would say. 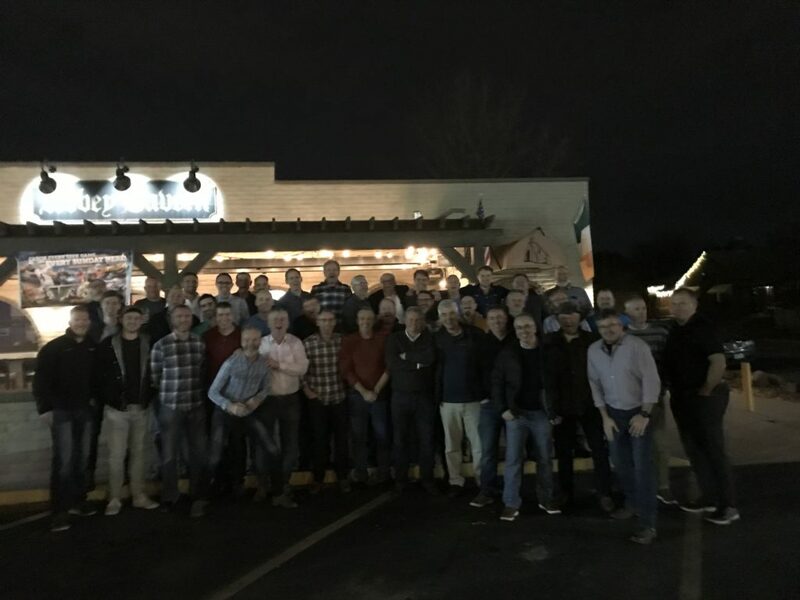 A few years ago the Irish lads around Denver were yearning for those days and the slagging and banter that went with them and decided that it might be a good idea to put the word out and see who might show up for a Christmas drink. There was a few small separate groups that would meet and have a pint, usually about 5 or 6 lads at most, that knew each other well. This was an opportunity to try to get everyone together so lads that did not know each other could meet and make connections. There were lads living in Denver from the same county that did not know each other. And so it began, the first year there was maybe 15 lads, the next there was 20 odd, and over the past few years there has been consistently 40+ lads. We all agreed that the night each year has been a great success, and we agree that we are lucky to be in this fantastic City and Country and are very grateful for where we are and the lives we lead since coming to the US. On the spur of the moment last year as it was the season of giving it was agreed that we would do a quick whip round (collection) of a few dollars to donate to a worthy local cause. It was unannounced last year yet we collected $500.00 that was donated to Horace Mann Elementary school in Denver which is in an area that struggles for resources for their school. The money was put towards a field trip for the students and was a really appreciated surprise for the school. This year we got a bit better organized and collected over $800.00 on the night that was donated to Food for Thought, a local charity that provides food for students to take home on the weekend (sometimes it is forgotten that kids don’t just need a lunch). 100% of donations go to purchasing the food and it is organized by volunteers, none of which take a salary. The founder and one of the board members Bob Bell was delighted and very appreciative to receive the donation.